At work today, we held an open house to show off the Voices of Duke Health listening booth. It’s a space inside the patient resource center, repurposed as a temporary recording studio. A dozen doctors, administrators, communicator colleagues, and others stopped by for a peek inside and to learn about our project to facilitate meaningful conversations. 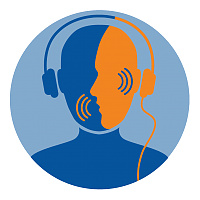 We’ve posted initial audio clips from previous forays of our mobile recording cart, and our first podcast episode, at listeningbooth.info. We’ll share many more voices in the weeks and months ahead. I’m lucky to be working with a talented team on this project. They’ve helped make this idea a reality, and for that I am grateful. I’ve been talking about an audio project since at least 2005 — here’s a blog post with an idea for Narratives of Your Life, or storyblogging. That was right around the time my friend Brian was organizing podcastercon; Brian now is my colleague at Duke, and podcasting is resurgent. Hence it’s good timing for Voices of Duke Health. Over on my microblog, I’ve been having fun with the microcast feature, and have posted short conversations with Malia and Oliver, and recorded myself stalking an owl through the woods beyond our house. All this is bringing back memories from high school in DeKalb, where I once volunteered to read for the radio service for the blind, and where I was one in a pair of seniors to read the morning announcements (and occasionally play a funny tune) over the school PA system.